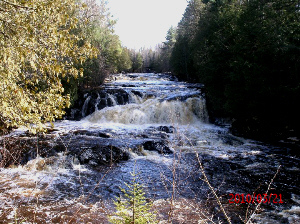 North of the city of Mellen, hiking and cross country ski trails meander throughout this beautiful Wisconsin park. 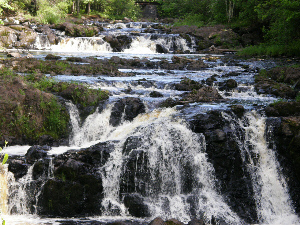 Self-guided nature trails and observation points overlook spectacular vistas of canyons, streams, and waterfalls. 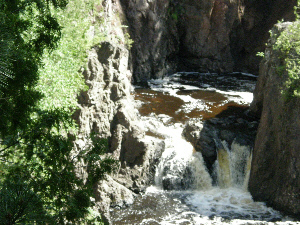 Copper Falls and Brownstone Falls highlight two miles of steep-walled gorges. 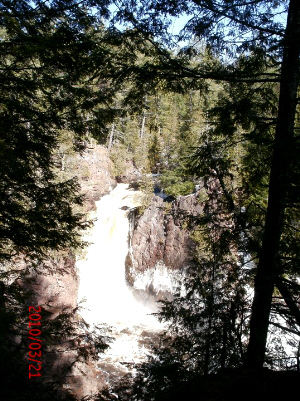 Offers a breathtaking view of the Penokee Mountain Range and the Chequamegon National Forest. Interpretive wayside exhibits unfold the colorful history of this ancient mountain range giving visitors a glimpse into the past. Located 2 1/2 miles west of Mellen on County Hwy GG, this overlook has a platform area for viewing with benches. Stairs lead to the overlook. 850,000 acres shared by Ashland and Bayfield Counties, the Forest provides endless trails for the outdoor enthusiast, a variety of breathtaking overlooks and landscapes and is home to several hundred wildlife species. 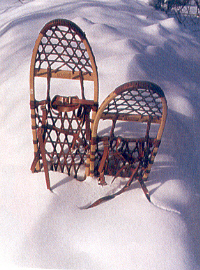 Activities include fishing, hiking, ATVing, horseback riding, wilderness camping, cross-country skiing, snowmobiling, ice-fishing and snowshoeing. 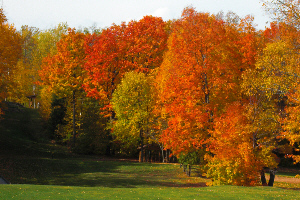 Fall colors attract many visitors who enjoy the scenic drives through the forest. 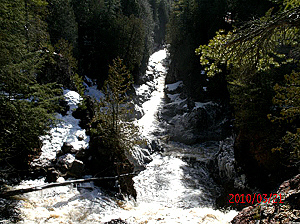 Located about 13 miles west of Mellen and 6 miles south of Sanborn in the Penokee Range. The 1600 ft. red granite dome is the highest point in the Chequamegon National Forest. On a clear day, you can see Lake Superior 20 miles to the north. At the south fork of Morgan Creek, a stream of water cascades 70 feet down the face of a rock cliff to a small shaded pool - creating a breathtaking natural scene. 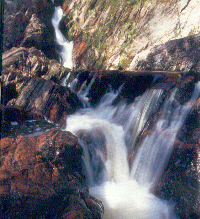 It is a 1/2 mile hike from the parking area to Morgan Falls, and beyond the falls, about one mile to the top of St. Peter's Dome. Parking sticker needed - available at any U.S. Forest Office (274-2511) - or $3.00 cash should be paid at entrance. Mellen is the largest town in Wisconsin on or near the completed North Country Trail. 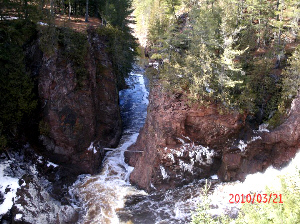 Mellen is located just a couple of miles from the eastern trailhead for this long-established trail in the Chequamegon National Forest. 2012 On Sept. 16, Mellen became Wisconsins first "Trail Town". This honor was presented to Mellen by the North Country Trail Association which recognizes a community through which the trail passes and accomodates hikers and other trail users. Mayor Joe Barabe accepted two trail markers identifying Mellen as a Trail Town. The North Country Trail runs from North Dakota to New York, a distance of 4600 miles. There are two quarries in the Mellen area. 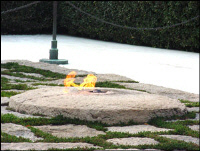 Fashionable building stone from these quarries was shipped to all points of the compass, including the President John F. Kennedy grave site. The museum is located in the restored Mellen City Hall, a Victorian structure listed on the National Registry of Historic Places. 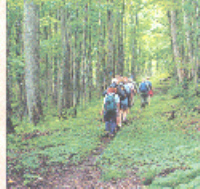 There are hundreds of miles of maintained recreational trails throughout the Mellen area, including the expanse of trails in the Chequamegon National Forest and the North Country National Scenic Trail. The Chequamegon Area Mountain Bike Association (CAMBA) offers over 300 miles of marked and mapped trails. 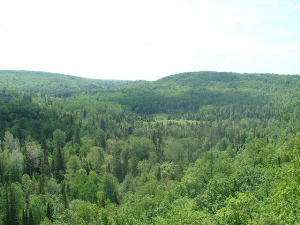 The Great Divide Scenic Byway winds along Hwy 77, through the hills of the Penokee Range, intersecting the heart of the Chequamegon National Forest. 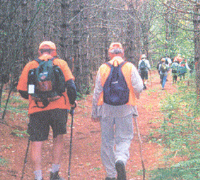 The Ice Age National Scenic Trail follows a ridge formed by the last glacier to cover this region. Fall colors in Mellen are spectacular. Be sure to come and enjoy miles of this rare beauty - a photographer's paradise. An archipelago of 22 islands located in Lake Superior off Wisconsin's North Coast 18 of which are in Ashland County, the Lakeshore is managed by the National Park Service. Explorers and vacationers alike will enjoy quiet, sandy beaches, rocky shorelines with sea caves carved by wind and water, island lighthouses, historical interpretive areas, wildlife viewing and wilderness camping. Excursion boats provide access to the islands.Catch them in Bayfield Wi. During the season, park staff provide tours to five of the six 19th-century island lighthouses. Private sailors, boaters and kayakers can travel around the archipelago and explore the fantastic sea caves carved into the sandstone cliffs along the islands and the mainland shoreline. Experience the past and enjoy the present at the Center, located 3 miles west of Ashland. Features include interpretive exhibits, boardwalks, trails, theatrical presentations, the Northern WI History Center, the State Historical Society Archives, Spirit of the North Gift Shop and a spectacular view of Lake Superior from the observation tower. The City of Mellen is ATV /UTV friendly. All streets with in the city limits where speed limit is 35 or less including State Hyws 13,77 and County Road GG but remember ATV/UTV speed limit is 15 mph. Drive save use hand singles. *This site is sponsored by the Mellen Area Chamber of Commerce, Inc.